CHARACTERISTICS OF ATOMS DOE-HDBK-1015/1-93 Fundamentals of Chemistry CH-01 Rev. 0 Page 2 Figure 1 Schematic of a Simple Atom (Helium) The Atom Structure All matter is composed of atoms, existing individually or in combination with each other. An atom is an extremely small electrically-neutral particle. It is the smallest unit involved in the chemical change of matter. Atoms can be treated as distinct particles because they behave as such chemically, but atoms themselves are composed of even smaller subparts. Understanding these atomic subparticles is important in understanding chemistry. 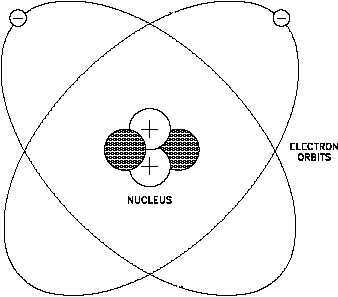 An atom is composed of a positively-charged nucleus orbited by one or more negatively-charged particles called electrons. A simplified schematic representation of this arrangement is illustrated in Figure 1. The nucleus is the core of an atom. It has a positive charge because it usually consists of two particles, the neutron and the proton (hydrogen is the exception with only a proton in the nucleus). The neutrons are electrically neutral, and the protons are electrically positive. A nucleus with one proton has a charge of +1 (or simply 1), and a nucleus with two protons has a +2 charge. Together the neutrons and protons give the nucleus its mass, but the proton alone gives the nucleus its positive charge. Neutrons and protons are relatively massive and are essentially equal in mass.